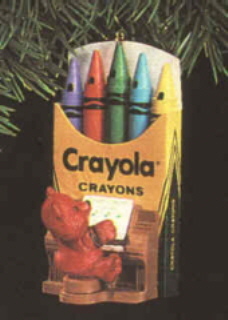 This is the third ornament in the Crayola Crayon series. Designed by Ken Crow, this Hallmark ornament is 3 1/4 inches tall. The back of the ornament has a UPC code for "Christmas" and the following caption: "1991 Crayola Crayons, Binney & Smith."